Or 'How to Make a Crocheter Cry'. 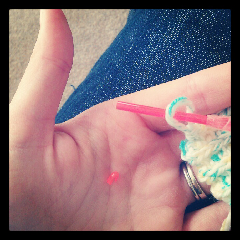 Halfway through the base of my jumper and my stupid plastic hook snaps..again. This means my 'nap time' crochet project is back to a blanket, at least until I can get to buy a new one. oh no! :( that is literally my worst nightmare, hahah! hope you get a new one soon!